"Experience is the benchmark of maturity." 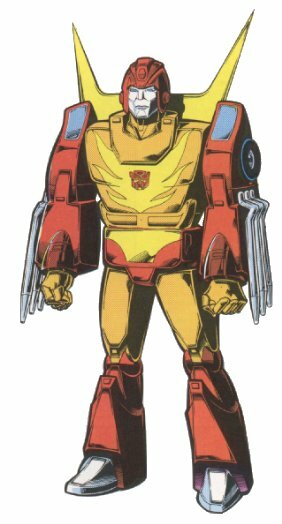 Profile: Rodimus Prime is the mature, transformed persona of Hot Rod. This transformation and simultaneous assumption of the Autobot leadership occured in a major battle between the Autobots and Decepticons. It is as Rodimus Prime that Hot Rod defeated Unicron and restored order to the galaxy. Rodimus Prime speaks with the savvy of a seasoned veteran. He can be hot-heated at times - he has a tendency to act first and ask questions later. Rodimus Prime's sole purpose is to protect all life. Abilities: He possesses acute military prowess. Rodimus Prime is an expert tactician with exceptional maneuverability in battle. In robot mode, he carries a photon eliminator that shoots high voltage electricity. Range: 500 miles. Speed: 200 mph. Weaknesses: His only weakness is his compassion for other living creatures.